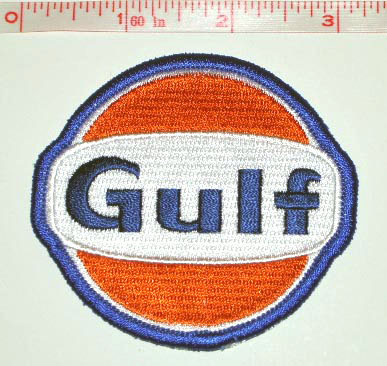 Embroidered patches are synonymous with automobile racing. When the phrase “race car driver” is mentioned, the image of a handsome young man or (or woman, kudos to Danica Patrick and other female drivers) wearing a racing coverall emblazoned with a wide variety of color patches immediately comes to mind. Race car drivers are easily recognizable by the embroidered patches on their coveralls, each promoting a different team sponsor. Automobile racing, be it NASCAR, IndyCar, Formula 1 or other types, is an expensive sport and racing teams rely on company sponsorship to help defray the costs. Sponsors in turn are looking for exposure, and in addition to signage/decals on the team’s racing car, the driver’s protective racing suit is a valuable property for displaying the sponsoring company’s name. The size and placement of the embroidered patch is in directly relation to the amount of sponsorship dollars. Much like the hood of the car is highly visible during televised races, the upper chest and even collar of a driver’s racing suit is considered prime placement for a sponsor’s name. This area is prominently featured in any headshot photos of the driver and is also on display during pre- and post-race televised interviews, providing valuable publicity for the sponsoring company and its products. But every square inch of the racing suit is available for sponsorship and patch display, including the back, sleeves and even legs. Every square inch of a driver’s suit can be used to display the embroidered emblem of race team sponsors. 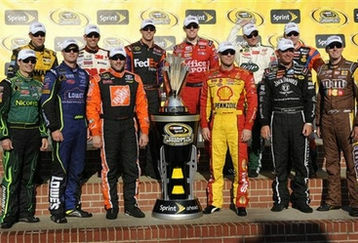 In recent years, sponsorship opportunities have greatly expanded with the popularity of NASCAR racing. In addition to traditional automotive-related products (car companies, gas & oil manufacturers, car parts and tires, etc.) and male-dominated companies (Home Depot, Old Spice, Viagara) racing sponsors now include such non-traditional products as candy companies, cereal manufacturers, soap producers, even the Coates & Clark sewing thread company. Embroidered patches to denote sponsors have the distinct advantage of flexibility. Companies frequently shift sponsorship funds and patches can be easily added or removed, or even shifted to a more- or less prominent place on the driver’s uniform. 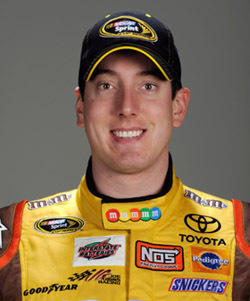 This publicity headshot of NASCAR driver Kyle Busch shows how patches are prominent in the image, even the neck tab of the suit is used to promote a sponsor. 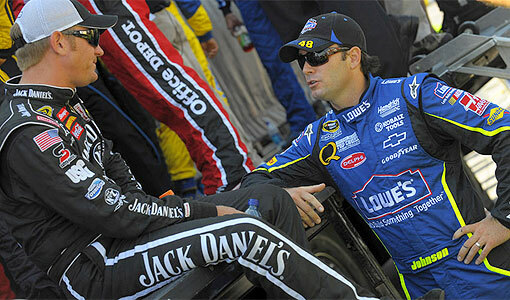 Patch covered racing suits, once the sole territory of drivers, have been expanded as companies look to maximize the effect of their sponsorship dollars. Drivers pit crews are now wearing sponsor’s patches on their coveralls and other members of the racing team and even the driver’s wives can be seen wearing patch covered clothing. Most motorcycle clubs are identified by their “colors,” a unique embroidered patch or set of patches, most often sewn on the back of the denim or leather vest worn while riding. To join a motorcycle club, prospective members are sometimes asked to perform/endure a set of tasks. During this probationary period, the prospect may wear an embroidered patch, but usually not the full club logo patch. The club embroidered patch is usually large for high visibility, 6-12 inches, with the name, logo, chapter (city/state, etc.) and “MC” for motorcycle club. The vest with patches is known as the colors or cut, as early clubs would cut off the collars and sleeves of a jacket to create a vest. Riders at the annual Sturgis, South Dakota, motorcycle rally proudly display their colors. 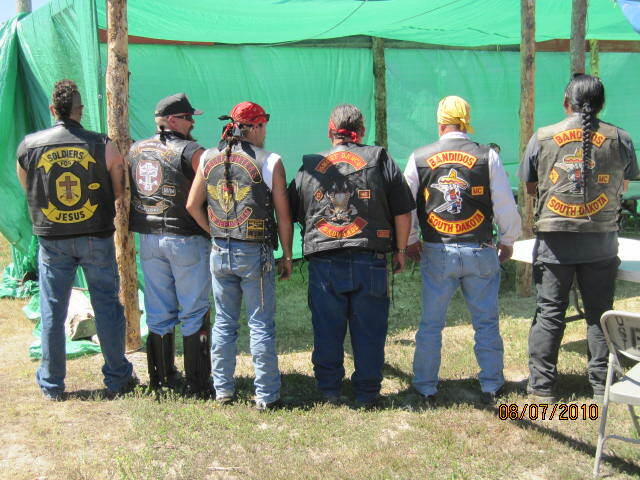 Collecting motorcycle club patches can be difficult as the patches are considered property of the club and only members are allowed to wear the club’s patches; losing/selling/trading one’s colors is considered the ultimate disgrace. Non-members affiliated with the MC may wear support patches with the club’s colors, but not the actual member logo. 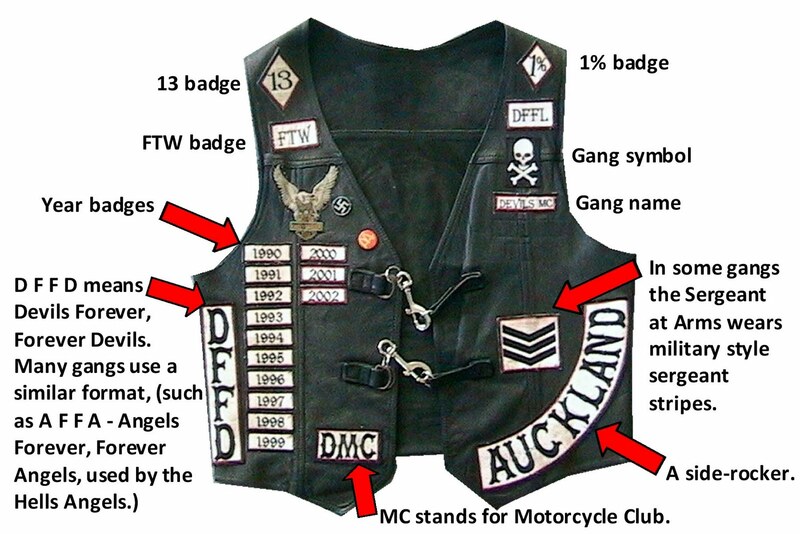 The colors worn by MC members sometimes use a system of a single patch for nonconformist social clubs, with a two piece patch for dues-paying members and a three-piece patch for so-called “outlaw” clubs (those who are not members of the American Motorcycle Association, AMA). A three-piece patch typically consists of the club logo with top and bottom patches, usually crescent shaped, known as “rockers.” The exact number and layout of these embroidered patches varies from club to club and a three-piece patch system doesn’t necessarily mark an MC as outlaws. Distinctive embroidered patches immediately identify a rider’s motorcycle club affiliation. 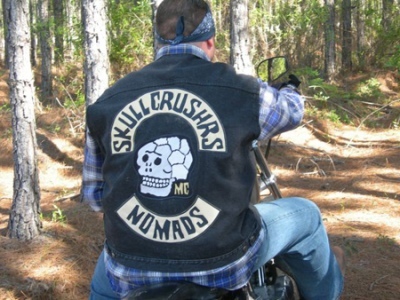 Some outlaw motorcycle clubs are readily identified by a 1 percent (%) patch worn on the colors, referring to the AMA’s purported statement that 99 percent of motorcyclists are law-abiding citizens, therefore identifying the remaining 1 percent as non-conformist outlaws. There are all types of different clubs, most of them the “99%”, and include clubs dedicated to certain types of motorcycles, clubs that like to ride long distances, racing clubs, and even clubs of police officers or medical first responders.